Before I continue, I should maybe show you the artwork that helped me get that Edge 20th Edge Anniversary cover. Last year, I was reading a thread in the World of Spectrum Forum about classic ZX Spectrum games that had terrible loading screens. This got me thinking. What if I was to create a new loading screen for these games. Hopefully, creating a loading screen of a standard that these games deserved. Now, with the vast number of games released on the ZX Spectrum, which game loading screen would I do first. There were a couple of suggestions in that thread, one of them I'd eventually go on to create later, but I chose "Ghosts n' Goblins", the tough-as-nails classic Capcom game released on the ZX Spectrum by Elite. 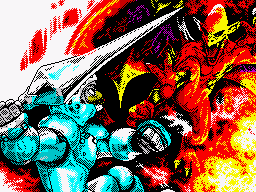 Now, the idea behind these new loading screens wasn't to be original, but to try and produce some really good ZX Spectrum art based on the cover or promotional artwork. I also see it as a bit of fun. I worked on the new "Ghosts n' Goblins" loading screen on and off over a 2 week period and this was the end result. As soon as I had finished, I wasted no time on starting the second one. By this time, I had trawled through the World of Spectrum game database searching for games where I thought the loading screen was woeful. Let me tell you, there are loads. But I was still only wanting to create loading screens for classic or well received games. I eventually settled on the second game to get a new loading screen, Ocean's "Gift from the Gods". Pretty much all of Ocean's artwork was done by Bob Wakelin, a truly fantastic artist, and I was to base the new loading screen on his artwork for the game. This time, taking a week and half, I produced this. You'll notice that for both of these loading screens I never put the game title in them. Originally, this was down to me not having enough space to include them but after finishing the "Gift from the Gods" screen, I decided that leaving the title out would be my "thing" with them. It was a way of purely showing off the artwork and also a way to highlight that these were unofficial. I had also decided that I would produce a series of these and would therefore do 12 new loading screens then call it quits on this venture. After a small break, I chose and started on the third one. Another Ocean title and again based on the Bob Wakelin cover art. "The Great Escape" is now seen as a truly great isometric game and there was a lot of love put into the game itself....apart from the loading screen, which looked like an after-thought or that they simply ran out of time. I worked on it over a 2 week period and I really want it to stand out. I wanted it to be great. I had learned a lot doing the previous 2 and here's the final result. I was desperate to do a good job as well as try and steer away from standard ZX Spectrum colour convention. I think I succeeded with regard to the colours and I hope I succeeded in producing something good that others like. 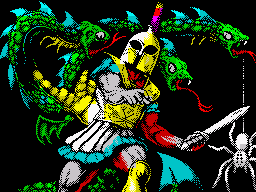 But the story of my ZX Spectrum graphics and my love of producing them goes back further, but that is for another time.